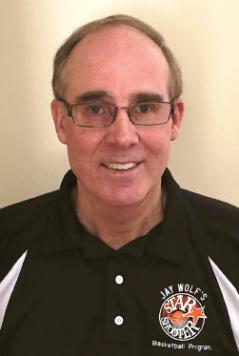 Early in Jay Wolf's 31 year career as a physical education teacher and coach, Jay made the discovery that using two hands to shoot was the main reason players shot poorly. To make matters worse, no amount of drill work would break the two-hand habit. Determined to solve the problem, Jay constructed a training aid on his wife's sewing maching that forced players to shoot with one hand. His home-sewn solution produced great results and in time, its success reached the basketball community. Today, it is used worldwide by players at all levels -even the pros- and by over 10,000 coaches. Jay continues to use his patented SHOOTING STRAP™ as he teaches shooting all over the world. His teaching skills have distinguished him as one of the best shooting instructors in the world. "Team improves from 5/16 to 16/11 win/loss record - We were small and couldn't shoot a lick. After using the Shooting Strap and Star Shooter's principles in every practice the next season, our outside shooting improved so much we went from 5 & 16 to 16 & 11. And yes, that's with the same players! " "Team becomes an outside threat - We couldn't spit in the ocean when the season started. After using Jay Wolf’s Star Shooter's Program, by mid season we improved so much we were encouraging the 3pt shot. " "Player improves 50% - When I saw how much my 9 year old improved in just four days using the SHOOTING STRAP and Program, I couldn't wait to use it with my shooting instruction. After using it on a 15 year old student of mine this summer, his accuracy improved 50% - from 28 to 42%. Now he's bringing me more students. " "Player improves 60% - I'm amazed that such a simple device can make such a major improvement. My brother raised his shooting from 25 to 40%. " "Team improves 17% from the field - I'm a firm believer in the Strap and Program. Our shooting improved from 41 to 48%. " "Team improves 81% from 3pt line - We used the STRAP every night and increased our 3pt success from 27 to 39%. " "I have used Jay Wolf's Program for a little more than a week and have seen excellent results. - My free throws have improved from 79% to 93%. " "My 8th grade son improved his free throws from 69% to 85% in only three weeks using your deluxe program. - One day he made 40 in a row. "